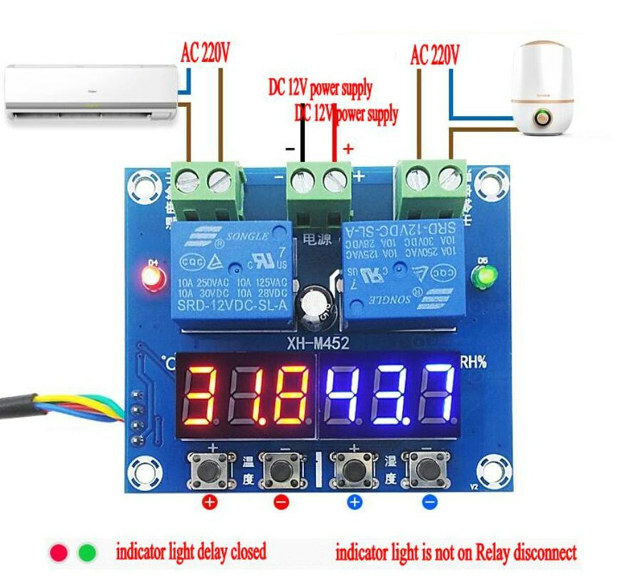 XH-M452 is a board designed to control the temperature and humidity in a room or cabinet. 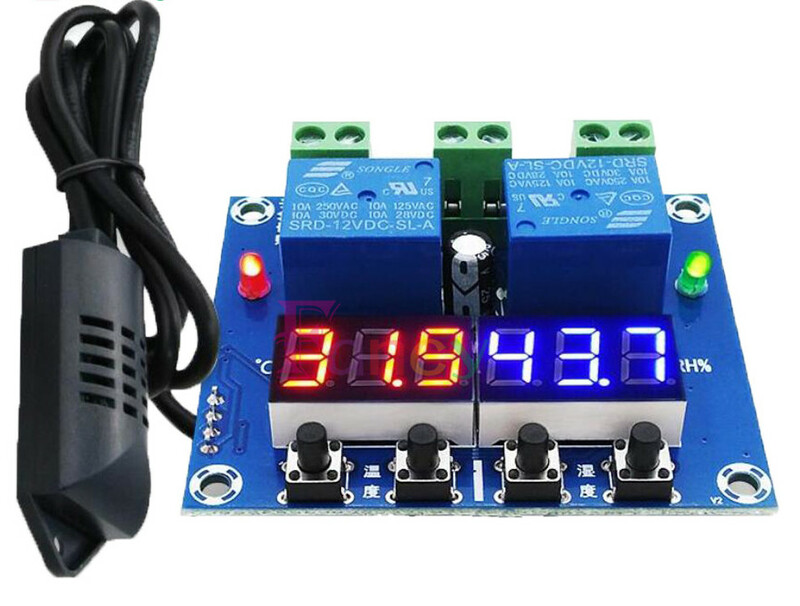 It comes with two relays to control appliances like fans, air conditioners, (de-)humidifiers, or heaters, and ships with a temperature and humidity probe attached to a one meter cable. Relays – 2x SONGLE 10A/250VAC 125VAC relays for temperature control (left) and humidity control (right). Misc – +/- buttons to adjust temperature and humidity; 2x relay status LEDs. You’ll need to provide a 12V power source for the board, connect an appliance to control the temperature on the left terminals, and an appliance to control humidity on the right terminal. Finally adjust the start and stop temperatures and humidity levels with the buttons, and you should be good to go. Heating mode is selected if the start temperature is lower than stop temperature, and cooling mode in the other case, while humidification mode is enabled if start humidity is lower than stop Humidity, and dehumidification otherwise. Such board can be used for hatching eggs, for tobacco processing, control a cabinet’s temperature, and so on. I first found the board on ICStation where it is sold for $18.99 shipped, but you’ll also find it on other stores such as eBay, Aliexpress, or Amazon for as low as $12.90 including worldwide shipping. Somebody also made a 3D printed case for the board.